Clear + Brilliant is a revolutionary, gentle laser skin care treatment, clinically proven to fight the effects of aging skin. This “baby fraxel” laser is a step up from a chemical peel, without downtime. Rejuvenate and re-texturize your face and hands, illuminate skin tone, refine and reduce pore size, and prevent signs of aging with a simple 15 minute treatment. Clear + Brilliant Laser uses microzones of non-ablative heat that are precisely delivered to leave your skin feeling smoother, and give you that “radiant glow” that comes from healthy refreshed skin. 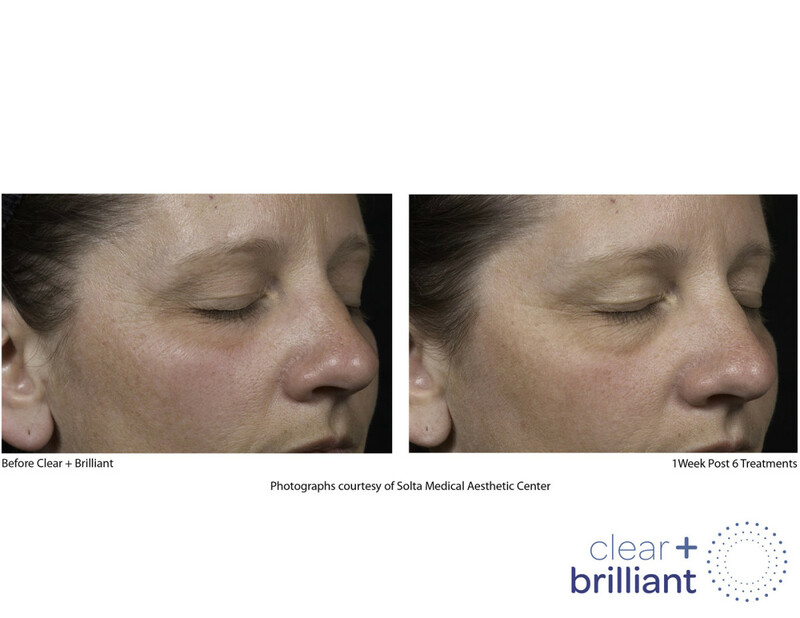 Clear + Brilliant was not only designed to be effective, but to deliver unparalleled patient comfort and safety also. The system includes smart-tip technology and an advanced precision energy delivery system – ensuring consistent results with little or no social downtime. What is Clear + Brilliant Permea? 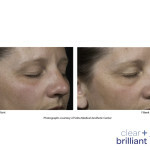 Clear + Brilliant Permea is a new treatment uniquely designed to produce visible enhancements in tone and radiance. During your consultation, your dermatologist can determine which Clear + Brilliant treatment (original or Permea) is right for you. 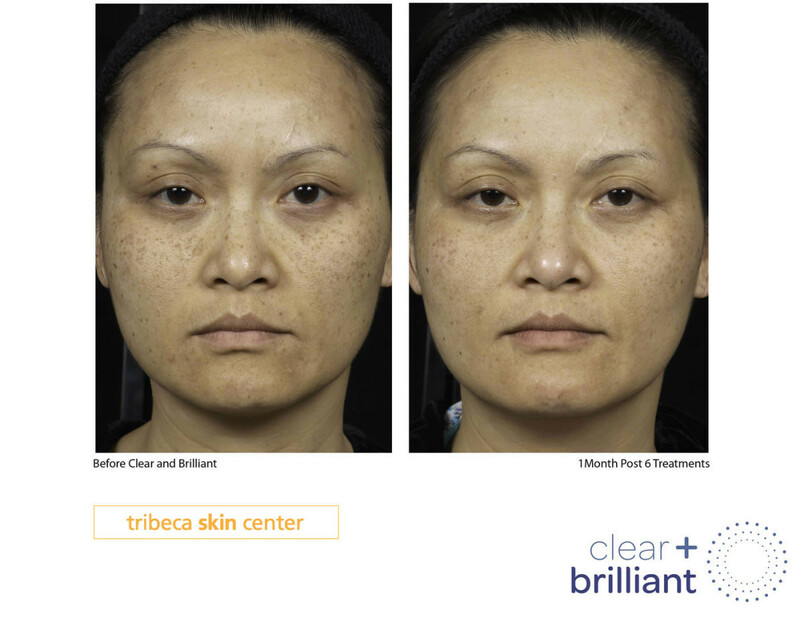 How does Clear + Brilliant Laser differ from Profractional Laser? We call the Clear + Brilliant our “baby fraxel”. Because it is much gentler, there is little to no downtime. 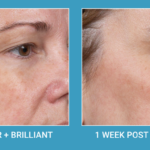 Clear + Brilliant Laser prevents the visible signs of aging and the overall dulling effects time and the environment can have on your skin, while Profractional remodels the skin in a much more dramatic way. If you aren’t sure which one is right for you, talk to your doctor and you could even consider the Tribeca Skin Center Hybrid Treatment. Who is a good candidate for Clear + Brilliant Laser? If you’re battling the effects aging can have on your skin, or trying to address it before the battle even starts, Clear + Brilliant can help. We find the treatments to be preventative for people in their late 20s, and regenerative for people in their 30s and 40s. How long does a Clear + Brilliant Laser treatment take? The treatment takes only about 15 minutes. Topical numbing takes about 30 minutes before your appointment. 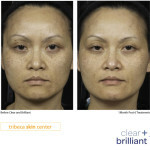 There is no downtime with Clear + Brilliant Laser. You can resume normal activities immediately. Your skin may appear to be flushed or sunburned at first, but that should disappear within a few hours. What does a Clear + Brilliant Laser treatment feel like? With numbing, patients experience very little discomfort. Results are apparent immediately, and better after a few days, and cumulative after a few sessions. How many Clear + Brilliant Laser treatments will I need? Multiple treatments deliver lasting results that can keep you looking younger for years to come. Generally, we recommend an initial 4 treatments over 4 months (talk to your doctor about the package we offer), and then quarterly for maintenance. Clear + Brilliant Laser is an easy treatment to add to your general beauty routine. What do I need to know before my first Clear + Brilliant Laser treatment? Please come in 30 minutes before your appointment time for topical numbing, and we will provide post-care instructions at time of your visit. Avoid immediate sun-exposure in the first 48 hours, and wear sunscreen consistently to preserve and maintain results of treatments.